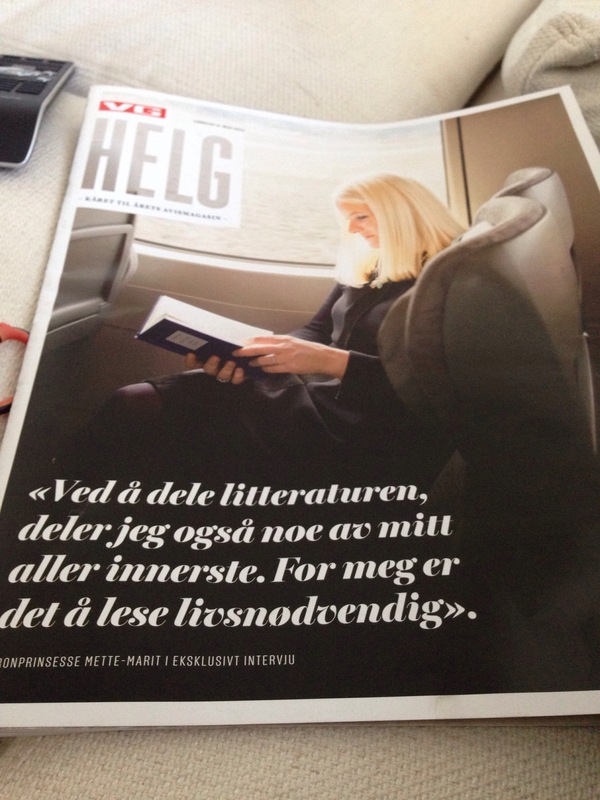 The weekend supplement to the Norwegian newspaper VG received an interview with Mette-Marit during the recent literary train ride. Snippets from the interview translated below. I find it interesting that her reading habits (not what she reads, but how she reads) mimics my own. Because I read a lot. And I read everywhere. Even before I got the Kindle app on my iPhone, I would frequently walk around with books in my bag to read when I had a minute or two. Mette-Marit: You know, it is completely implausible to me that people get nervous about meeting me. Interviewer: Don’t reading require time alone for you? MM: No, for me it doesn’t. I read everywhere. If the book keeps the momentum going, I can read all night when the house is quiet. I read in the car on my way to work, I read in the sun, in the summer holidays and when I travel. I read a lot on airplanes. Interviewer: Do you get peace to read with your fear of flying? MM: I am not afraid to fly any more. If you’re afraid of flying, start meditating. I’m not kidding. It has helped me, I’m not afraid anymore. And I was scared. Really. Interviewer: What disturbs you when you are reading? MM: I lead a fragmented life. There are huge contrasts all the time. One day I am in Vietnam, and the next day I have to deal with the children getting to school and then the day after there is a gala dinner. There are not many regular days, but the books become something tangible to hold on to through all the experiences. Interviewer: Do the reading make you put your life as a Crown Princess into perspective? MM: No, I tie what I read to my life in other ways. I have lived a life before I became a Crown Princess as well. I know very well what it means, especially the bit about not having a lot of money. I was a single mother. I can definitely recognise myself in what he [author Tomas Espedal] writes about. Interviewer: Do you… Does the Crown Princess write herself? MM: Say you. It makes it all easier. Do I write myself? What to say? Yes. No. Really. Yes, I do write something of my own, but nothing that will ever be published in any way. Interviewer: You don’t want to publish it either? MM: No, are you mad? I don’t want to publish anything. Interviewer: There are probably some publishing houses that would love to publish what you write? and thought: This is the reason I can never be an author, because I am just not that smart. MM talks about how she spends a lot of time talking about books with her friends. Interviewer: Does the Crown Prince participate in these [literary] conversations as well? MM: Yes, he does, but he does not read as much as I do. Haakon is a bit challenged about reading quickly and spends more time on books. I often recommend books to Haakon and tell him: You must read this one. When they fell in love, they read together. and would meet up to discuss it. Interviewer: Which genre would the book of your life be, do you think. MM: I think it would have been a fun book, with a lot of strange stories. But there are so many special things that it would have been difficult to write it straight out, as if it was real. A lot of my life is so improbable that it wouldn’t have been a book. I don’t think it would have been a book I would have read myself.